In the aftermath of the 1989 Velvet Revolution that liberated Czechoslovakia from a 40-year communist spell, an elitist pair shook hands to a political decision that split the country into two. The “velvet divorce” identified the Czech Republic in the west and Slovakia in the east. The world chose to embrace only one capital: the Czech one. Prague took the financial system by the hands and soon investments poured in. The country scrubbed, bathed, polished and repainted its national heritage sites. Key leaders invited professionals to study culture and plan new business centers. Scholars followed, stopping over in neighboring Budapest, Hungary and Vienna, Austria to exhibit characteristics of such new developments. Meanwhile the young Slovakian city watched the skies for commercial planes destined for their sister capital. Kicked to the curb, Bratislava dressed in drabs. Tears in significant monuments required new stitching. Waterway zones and bridges along the Danube fragmented into run-down and abandoned pockets only frightening foreigners already discouraged by first impressions. The economy stagnated for a while, then picked up and grew slowly .But it was too late for academic and entrepreneurial communities who packed up with sights on Prague in search of golden opportunities. The future for Bratislava, outdated and grim, dwelt in the shadows of Prague. In 2004, Slovakia received the golden ticket when the Czechs and surrounding nations stood in line to receive membership into the European Union. The economy advanced and became responsible for one of the fastest growth rates in the EU. 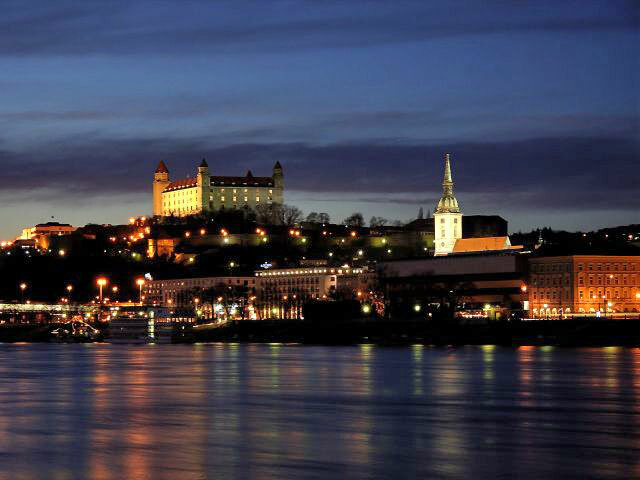 Low-cost airlines transformed Bratislava into a hub for cheap tourism. Tourism grew with the hospitable service sector which currently employs half of country’s population in the capital alone. Servicemen outfitted new enterprises in destitute neighborhoods along the Danube. Renovators including Czech notables submitted project proposals for rows of baroque facades along the riverbank. Dutch gardeners and German architects drew plans for formal gardens and municipal buildings nearby. Today Slovakia is no longer “the black hole” or “the black sheep” of Central Europe. The transportation system has improved since the country joined the euro zone in 2009. In Bratislava, both luxury and smart cars can be found zipping along the large international motorway junction that eases the pressure on the urban highway system and connects major roadways of Central Europe. On any given day the Reichhold Electric Car passes quietly on any of the five bridges arching over the Danube (ordered by the flow of the river): Lafranconi Bridge, Nový Most (The New Bridge), Starý Most (The Old Bridge), Most Apollo and Prístavný Most (The Harbor Bridge). These structures draw more visitors as a result of road and traffic engineering than some of ’s most famous structures including the Charles Bridge. 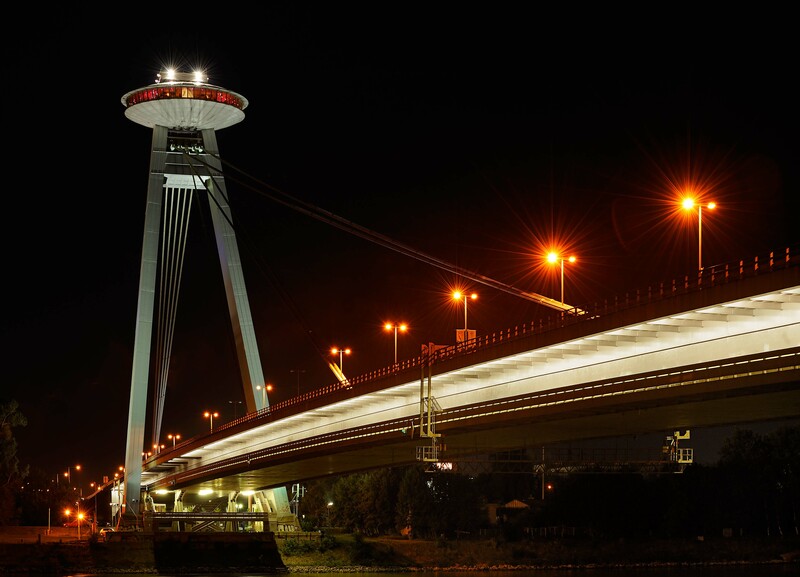 The UFO New Bridge restaurant is a sharp contrast from the Bratislava Castle on the other side of the river. Opened in 2005, after two years of refurbishment work, the flying saucer-shaped café hovers over the city in modernist glory. From within the structure, the view shrinks rows of wide passenger boats that head to Devin or Vienna, and across the North and Black Seas via Rhine-Main-Danube Canal. Slovak Radio’s inverted-pyramid-shaped headquarters disrupts the scenery in an unforgettable way. 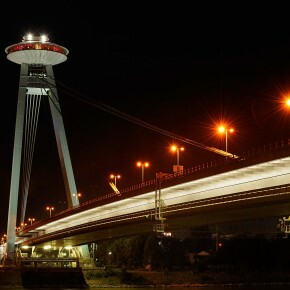 Like Prague’s famous telecommunications tower, Bratislava’s Kamzík TV Tower with its observation deck and rotating restaurant is a contemporary tragedy that should have instead served as an attraction to the UFO Beach. The “Café del Mare” styled beach under the restaurant hosts many bachelor-styled stag parties year-round. The Danube riverbank, adorned with medieval towers and grandiose 20thcentury buildings in the Baroque style, serves a pleasant backdrop for renowned cultural events. Folk dance group stage performances alongside gift stands that sell Andy Warhol replicas. Born to Slovakian immigrants, the American pop artist’s first spoken language was Slovak, but he refused to claim the country as his own. Most historic buildings are concentrated in the Old Town where the rediscovery of forgotten monuments sets the agenda. Erected in the 14th century, the Bratislava Town Hall is layered with stone and wood that in the form of three townhouses of same material. Decades of reconstruction has turned the complex into a Gothic artifact that once contained a mechanical clock. The clock would’ve paid a compliment to Michael’s Gate, the only restored gate from the medieval fortifications and to St. Martin’s Cathedral, the coronation church of the Kingdom of Hungary ruled by Ferdinand I. Interestingly it was the Franciscan Church that elected the Holy Roman Emperor and celebrated many of the knighting ceremonies. Beautiful forests complete the Bratislava montage. The foothills of the Little Carpathians and its riparian vegetation on the Danubian floodplains set the crown over city center buffers. The largest public green space is Horský Park (Mountainous Park), in the Old Town, followed by the Bratislavský Lesný Park (Bratislava Forest Park), in the heavily forested Little Carpathians. The Janko KráL Park covers portions of the riverbank and plans for a new city park is expected to expand into the footprint of two nearby lakes. The intersection of road and water transport and its position on these crossroads designates the capital as an entrance gate not only to the country but also to Central Europe. Awake from its hibernation, the lonely heart pumps new blood into regional organs left scarred from political will. Bratislava is a case study of self-rediscovery and it thirsts for new opportunities to reshape the honourable character of this once forgotten city.